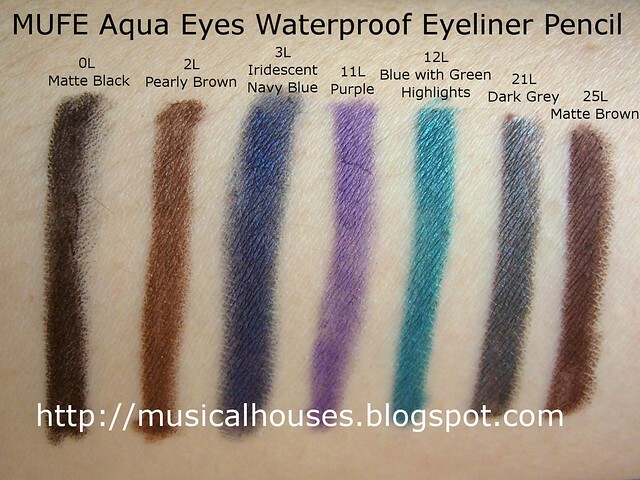 The MUFE Aqua Eyes Eyeliner Pencils are fast becoming one of my favourites. I only used to trust Urban Decay for pencil eyeliners (everything else seemed to fade much faster on my lashline), but recently, I've acquired a bunch of MUFE eyeliners, and have found that they are also excellent as eyeliners - good pigmentation and glide (so no tugging at skin), great range of colours, good wear without fading or smudging, and they are actually waterproof (so if you dip your head in water they will stay on). My little collection of MUFE pencil eyeliners! So naturally I thought I'd swatch my small but growing collection of MUFE pencil eyeliners. All of these have great pigmentation and glide. Also, you'll note that all of these are extremely wearable colours, too. Bonus! 0L Matte Black is just that, a matte black. Classic. 2L Pearly Brown is a very nice warm brown with a pearlised finish. Very wearable, without being boring, or leaning too orangey or red. 3L Iridescent Navy Blue is a deep navy blue, with a shimmery finish. This is a great alternative to black, for one of those days when you want to inject some colour without your look screaming "BLUE EYELINER!" 11L Purple is a lovely blue-leaning violet. This is one of the brighter colours I have, but it's still very wearable. 12L Blue with Green Highlights is a nice turquoise with shimmer, although there are no discrete specks of glitter in the colour. It's also quite deep, so you don't have to worry about the colour being unwearable either. This one would look great with a neutral eye for a pop of colour. 21L Dark Grey is just that - a dark concrete grey without shimmer or glitter. Another great alternative to black for fairer-skinned girls who find black too harsh for them (like me!). 25L Matte Brown is exactly that - a lovely matte brown with no excess shimmer or glitter. I think this is the perfect brown shade - it's not too dark, not too light, not too grey, and not too orange. Love it! My experience with these has been great. I always feel like eyeliners and mascaras are so personal (what works for someone may he totally off for another person), but for me, the Aqua Eyes Eyeliner Pencils have been great. I've no complaints about them at all, so if you see one you like, it's worth checking out. so many nice colours! i think my fav has to be the navy blue thought. 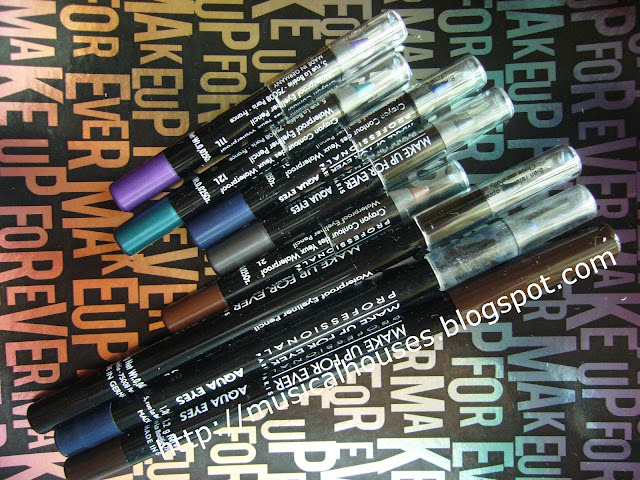 I never say no to a good eyeliner pencil :) thank you for the review!